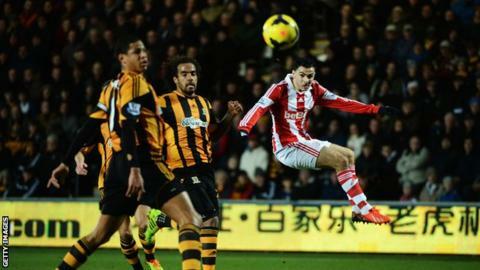 Stoke have opened talks with Liverpool over signing on-loan winger Oussama Assaidi on a permanent basis. The Morocco international, 25, has spent the season at the Britannia Stadium and has made 24 appearances in all competitions for the Potters, scoring four goals. "There's been tentative enquiries," said Stoke boss Mark Hughes. "We like Ossie and if we could come to an arrangement with Liverpool we would like to bring him here." Assaidi joined Liverpool from Dutch side Heerenveen in 2012 but made just four substitute appearances in the Premier League for the Reds before moving to Stoke in August. Hughes added: "He's done really well here. It's certainly helped him and Ossie's certainly helped us."